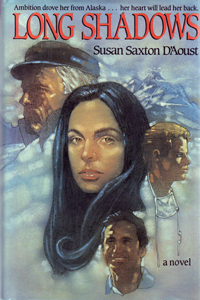 Saxton D'Aoust is the author of Long Shadows (1988), a story set against the untamed beauty of 1930s Alaska. Battling fierce cold, bear attacks, reindeer stampedes, plane accidents, and constant hunger, Ellen MacTavish dreams to escape her isolated world and become a doctor. Her journey takes her from her small village to a military base in the Aleutian Islands to Seattle and New York. Intricately woven, extensively researched - the author travelled throughout Alaska - Long Shadows is at once a dramatic love story, an action-packed adventure, a thrilling suspense novel, and a compelling story of Alaska and its people. 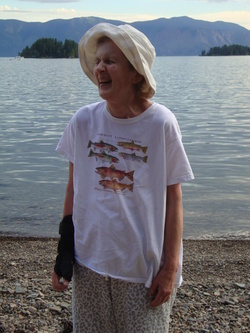 Saxton D'Aoust also published two additional books under the pseudonym Susan Shaw, wrote poems, and won a Washington State Fiction prize for her short story Deoxy. In addition to writing, Saxton D'Aoust was an avid gardener and taught bread making classes on Bainbridge Island.